Rhodes Scholarships 2018 - The Rhodes Scholarships to study at Oxford University for International Students 2018 is now open. The Rhodes Scholarships are postgraduate awards which support exceptional students around the globe to study at the University of Oxford. Established in the will of Cecil Rhodes in 1902, the Rhodes is the oldest and perhaps the most prestigious international scholarship program in the world. 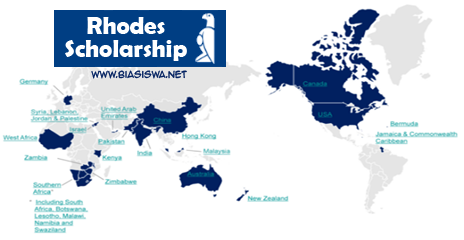 A Rhodes Scholarship covers: All University and College fees; the University application fee; a living stipend (�14,276 per annum 2016-17); one economy class airfare to Oxford at the start of the scholarship and one economy flight back to the student�s home country at the conclusion of the scholarship. The Rhodes Trust is now accepting application for the rhodes scholarship this year (2018). Select your region and start your application through the link below. It is important to read the how to apply page and visit the official website for detailed information about how to apply for this scholarship.